The South Carolina Division-Sons of Confederate Veterans side of the NCAA boycott inline with the NAACP of gaming events being held in this state has never been about money. It has always been about holding the line for what is right and just as a free people of a sovereign state. Only those two organizations have made it about money in order to pressure those in power to fold to their demands and ignorance and made up beliefs that they are somehow being disrespected. That road has two lanes. Their sole purpose is to deny and suppress the rights of Southerners to Honor our Confederate Heroes. By holding true, the day is soon approaching that we win one more battle. COLUMBIA, SC (WIS) -As the Gamecocks women’s basketball team skillfully climbs the ranks of the Associated Press Top 25 poll, they have a shot at a No. 1 seed in the upcoming NCAA Division I Women’s Basketball Tournament. However, the team’s position already means one thing: they will not be able to host any postseason action because of the Confederate Flag. It’s been an on-going 14-year fight for the NAACP to have the flag removed from the State House grounds. In that time, the flag has also stood in the way of the Gamecocks women hosting any championship games. That will all change next year though even if the flags stays flying high. 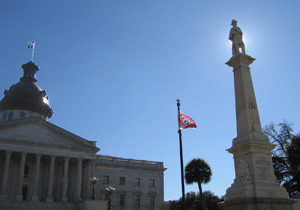 Since 2001, the NCAA has banned the state of South Carolina from hosting any postseason events whose sites are pre-determined all because of the Confederate Flag. Next year, the NCAA’s rules are changing. The postseason sites will no longer be pre-determined. So if the Gamecocks place in a top 16 seed, they will be able to host. Long time flag detractor and South Carolina NAACP President Lonnie Randolph says he has not tried to appeal to the NCAA on this matter. “We did not have an opportunity to go before the governing body of the NCAA. We, meaning the NAACP, and ask them to not give in to the pressures of money and economics for disrespect,” said Randolph. Not only does the team lose out on a competitive advantage without being able to host, the state loses out on potentially millions in an economic impact. That’s all something Staley hopes will be different moving forward. Since 2002, the USC baseball team has made six trips to the College World Series. In all but one instance, they won a super regional at home to earn a trip to Omaha.